Whether animals, plants, fungi, bacteria or people: enzymes containing iron are at work in almost all living organisms. In the human liver, such an enzyme acts like a kind of biological waste incinerator: it oxidises harmful substances, medication or the body’s own materials, to excrete them via the kidneys. In order to fulfil their vital task, the iron atom inside the enzyme constantly switches back and forth between a magnetic and non-magnetic state. An international research team led by Professor Rainer Herges from the Institute of Organic Chemistry at Kiel University (CAU) has now succeeded in designing for the first time an artificially-produced iron molecule, whose magnetic spin state can be switched on and off via UV light. Spin is an intrinsic form of angular momentum – one of the primary characteristics of elementary particles – and a way to change the functions of molecules in a controlled manner. Such switches could also be used for numerous other applications, such as regulating further enzymatic reactions, chemical catalyses or for converting methane. The research team’s findings have been published recently in the renowned journal Nature Communications. „Enzymes, such as the ferrous cytochrome P450 in our livers, operate as independent molecular machines,“ explained Rainer Herges, Professor of Organic Chemistry and spokesperson for the Kiel Collaborative Research Centre 677 „Function by Switching“. „Their biological functions are based on switching processes, which we explore and want to control as far as possible.“ In collaboration with scientists from the Ruhr Universität Bochum (RUB), the Max Planck Institute for Chemical Energy Conversion (MPI CEC) and the National Institute for Interdisciplinary Science and Technology (NIIST) in India, they have now taken a further step towards achieving this: modelled on the cytochrome P450, they designed a ferrous molecule they can switch back and forth between different magnetic states using light in order to change their characteristics. In the liver, the ferrous enzyme cytochrome P450 „lies in wait“ for substrate molecules such as pollutants, in order to render them harmless. In this “standby” state, the enzyme is inactive and has a stable, so-called „low-spin“, i.e. many of its electrons are arranged in orderly pairs. As soon as a pollutant molecule approaches and is detected by the ferrous enzyme, the molecule docks on the enzyme. The enzyme then changes to a „high-spin“ state, in which most of the electrons are arranged individually (unpaired). In this state, the enzyme can also adsorb oxygen in addition to the pollutant molecule. In a multi-stage process, the molecule is converted with the help of oxygen, and oxidises until it leaves the iron enzyme again in a harmless form. The enzyme then returns to the „low-spin“ waiting position, and is ready to tackle the next pollutants. As a possible application for switchable iron enzymes the researchers consider the conversion of methane to methanol to produce liquid fuel. “When extracting crude oil, unused methane gas is released, which is deliberately burned by the oil drilling companies. As such, each year approximately 140 billion cubic meters of methane are destroyed, which we could convert into valuable fuel instead,“ said Herges confidently. This conversion is already possible by means of a technical process. However, it requires temperatures of over 400°C. In addition, more than half of the methane’s energy is lost. Bacteria, however, are able to convert methane into methanol at room temperature and with virtually no loss of energy. To do so, it uses enzymes containing iron, so-called methane monooxygenases, whose spin states are also switchable. If the reactivity of the ferrous enzymes could be controlled in this way, then a biomimetic conversion of methane to methanol on a large scale is conceivable in future. Artificial molecules containing iron, such as those developed in the research group led by Rainer Herges, could then be used for efficient methanol production. 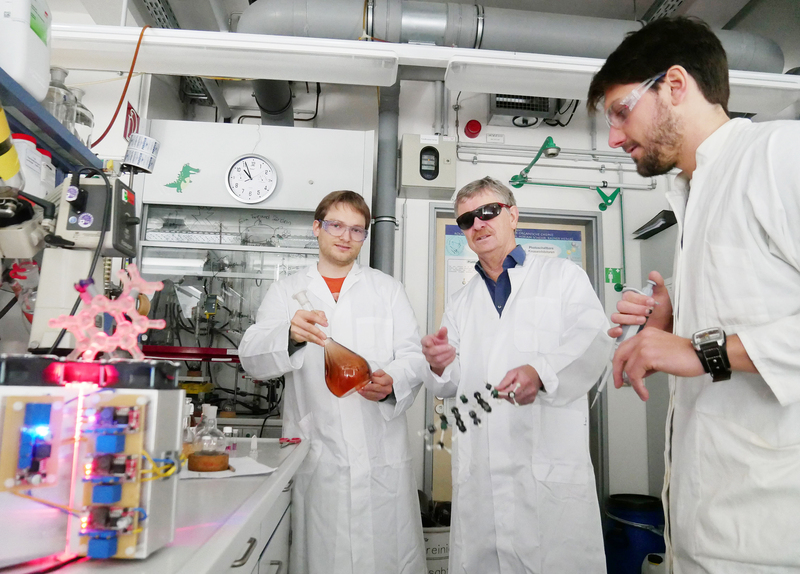 Caption: Together with his doctoral students Kim Steinborn (left) and Morten Peters Professor Rainer Herges (middle) has designed a ferrous molecule which properties can be changed via UV light. Caption: In the so called „low-spin“ state the enzyme is not reactive. Only switched into the “high-spin“ state it is activated.